Chris Forrester scores the only goal for Posh at Swindon. Photo: Joe Dent/theposh.com. It’s fair to question tactics, team selection and where the goals are going to come from, but Peterborough United’s spirit and resolve are surely no longer debatable points. One would imagine Bury striker James Vaughan had been haunting Grant McCann and his players for a week, but that particular demon was exorcised by a clean sheet and a valuable three points at the County Ground. Posh substitute Paul Taylor in action at Swindon. Photo: Joe Dent/theposh.com. It was far from pretty, and it was often very dull as two midfield diamonds effectively caneclled each other out, but it’s time to accept this is a different Posh side with different strengths to those lovingly created by Darragh MacAnthony and Darren Ferguson in recent years. Sure, pretty passing patterns do appear from time to time and there is pace and quality in the attacking third, but the tempo, drive and sheer attacking gung-ho of previous Posh promotion bids is not how Grant McCann’s men tend to secure points. And that’s not a criticism as such. Organised defending, top-notch goalkeeping and a burning will to win can deliver success, just as those who followed Burton Albion last season will confirm. And if end-of-season glory does await, this 1-0 win at Swindon will probably be seen as a vital victory, coming as it did seven days after a traumatic afternoon at Gigg Lane. Posh striker Lee Angol in an aerial duel at Swindon. Photo: Joe Dent/theposh.com. Where Posh were wide open and punished by a deadly predator a week ago, they were so solid and disciplined on this afternoon (January 21), goalkeeper Luke McGee was not called upon to make a single save. Posh were helped by one of the more toothless forward lines they’ve met recently, but they also earned the clean sheet by snuffing out rare moments of danger with brave blocks and well-timed tackles, most notably when the irrepressible Michael Bostwick hurled himself in front of Nathan Thompson when the home right-back bore menacingly down on goal in the first-half. Bostwick was re-deployed in midfield - something that won’t necessarily help the team’s passing fluency - and was quite brilliantly destructive. His move forward enabled on-loan Dominic Ball to deliver a composed, stylish display at centre-back and it also freed Chris Forrester to play in a more advanced role, a switch that effectively won the game. It was Forrester who struck 52 seconds into the second half after one fine pass from Marcus Maddison, and one with just enough accuracy from Lee Angol, presented the skipper with the opportunity to drive the ball hard and low past Swindon ‘keeper Lawrence Vigouroux from just inside the penalty area. Vigouroux got a hand to the ball, but couldn’t stop it bobbling over the line. “Every time I play Bostwick in midfield, Forrester scores,” Happy Posh Grant McCann enthused. He should also be pleased that recalling Maddison and Angol to the side worked well with the former’s set-piece deliveries causing the home defence problems and the latter’s physical and technical ability useful in retaining possession in the opposition half. Maddison was denied a fourth-minute assist when Ryan Tafazolli’s close-range header was well-saved by Vigouroux. The only other clear opportunity of the opening period was spurned by Tom Nichols who scooped a volley over the crossbar after fine work down the left-hand side by Forrester and Andrew Hughes had found him unmarked eight yards from goal. “We looked the more likely to score before the break,” Swindon head coach Luke Williams insisted rather unconvincingly after the game. “But we were caught asleep at the start of the second-half and they then caused us more problems at 1-0 than they had at 0-0. Faint praise from a defeated coach who could have done with star man Ben Gladwin’s fast feet being seen in more dangerous areas and a greater input from three on-loan Chelsea players. Apart from a flurry of second-half corners, most of which ended up on Tafazolli’s head, Swindon couldn’t sustain any sort of pressure in their bid for a comeback. A tendancy to overplay, played into the hands of a back four who love a tackle. 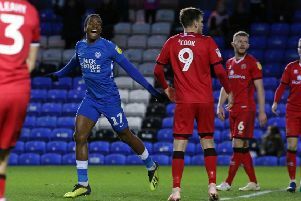 Posh rarely threatened to score again - they’ve now scored one goal in each of their last six matches - with Maddison’s poor control ruining the best chance after he looked set to break free 15 minutes from time. But one goal was enough as Posh again ensured they haven’t lost back-to-back League One games this season. The fact that Swindon hadn’t lost a home game in the league since October means this should be seen as an impressive three points. Ball’s arrival gives McCann options in a squad that is being culled on a weekly basis. He clearly rates the centre-back borrowed for the rest of the season from Rotherham United. “You don’t win cups and titles in Scotland without being a very good player,” McCann stated, in all seriousness. It was too cold to summon up an argumentative response. Posh: Luke McGee, Michael Smith, Andrew Hughes, Dominic Ball, Ryan Tafazolli, Michael Bostwick, Chris Forrester, Gwion Edwards (sub Leo Da silva Lopes, 82 mins), Marcus Maddison (sub Martin Samuelsen, 86 mins), Lee Angol, Tom Nichols (sub Paul Taylor, 72 mins). Unused substitutes: Mark Tyler, Junior Morias, Jerome Binnom-Williams, Brad Inman. Swindon: Lawrence Vigouroux, Fankaty Dabo, Nathan Thompson (sub James Brophy, 78 mins), Raphael Rossi-Branco, Lloyd Jones, Ben Gladwin, Yaser Kasim, John Goddard (sub Jordan Stewart, 78 mins), Islam Feruz (sub Jermaine Hylton, 54 mins), Charlie Colkett, Luke Norris. Unused substitutes Will Henry, Conor Thomas, Anton Rodgers, Sean Murray. Goal: Posh - Forrester (46 mins). Cautions: Posh - Smith (foul), Maddison (foul).